This article written by Anubhav Pandey perceives the Road accidents that happen in a day-to-day life, from a different angle and narrates How a victim can claim for Road Accident Compensation as per M.A.C.T. Guidelines. What is the process that one should follow to get compensation after facing a road accident?The sight of the accident is very common on Indian roads. Over 400 people were killed in road accidents every day in 2015, government data reveals. The hapless victims are left paralyzed on the street and after by the intricacies involved in legal machinery. 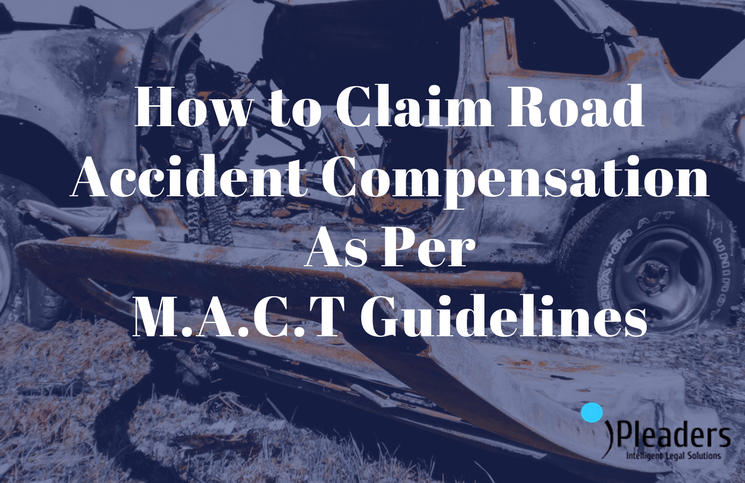 Here is a simplified guide on how one can get compensation if it ever becomes a victim of a road accident. Rapid justice and speedy trial are two eyes of any justice delivery system. The justice delivery system in M.A.C.T (Motor Accident Claims Tribunal cases) is far away from satisfactory. Say, an owner of a brand new Mercedes while returning from his game of hunting crashes his car into a footpath, killing civilians over it. One is the commission of the criminal offense. Second is the compensation claim. One should take pictures of the accident scene or even a video for use as evidence later on. Even just a passer-by can do this and provide the photos or videos to police for support in investigation and delivery of justice. They should, however, call the 100 number (police hotline) and inform what the situation is in a clear and calm manner. What is said on this call gets recorded and can be used as evidence later on. Legal intricacies involving demand of proper compensation to be put forward before MACT tribunal. Who Can Claim Compensation in Motor Accident Cases? By the person who has sustained the injury. By the owner of the property where death has resulted from the motor accident. By all or any of the legal representatives of the deceased. By any agent duly authorized by the person injured or all or any of the legal representatives of the deceased, as the case may be. Suggestive Read: How and when to file claims with Motor accidents claims tribunal? Jurisdiction: Where Should One Claim Compensation for Motor Accident? Or within the local limits of whose jurisdiction the defendant resides(Nearest Tribunal Where The Accused Resides). If the Driver Had No Fault in the Motor Accident then, Can the Victim Still Get Road Accident Compensation? A, as per her mother’s instruction went to a shop for local veggies. First, she looked left then right and then left and then took the zebra crossing. But, while crossing hurriedly, she was hit by a car. Even though there was no fault on either side, what could be the intricacies involved while demanding road accident compensation in this case? Where death or permanent disablement of any person has resulted from an accident arising out of the use of a motor vehicle, the owner of the vehicle or the owners of the vehicles, will be liable to pay road accident compensation in respect of such death or disablement. For a victim, one does not need to prove the negligence of the opposite side, it is assumed. The victim need not be required to plead and establish that the death or permanent disablement in respect of which the claim has been made, was due to any wrongful act, neglect or default of the owner or owners of the vehicle or vehicles concerned or of any other person. How Much Road Accident Compensation is One Entitled to in Case of Motor Vehicle Accident in India? Simply put, if a driver is involved in an accident in India and if it caused victim’s death then, a minimum of INR 50,000/- and if permanent disablement is caused then, a minimum of INR 25,000/- must be paid. A claims tribunal can pay even more after considering the case. The owner of the motor vehicle or the authorized insurer shall be liable to pay in the case of death or permanent disablement due to accident arising out of the use of a motor vehicle under section 163A. “There can be no doubt that, compensation claimed u/s 140 is governed by the no fault principle”. Permanent privation of the sight of either eye or the hearing of either ear or privation of any member or joint. Permanent dis-figuration of the head or face. For instance: ‘A’ purchases a motor vehicle through a Nationalized Bank on 1.10.1993 and the said vehicle is insured for ‘The Period Of One Year’. He sells the vehicle to ‘B’ on 3.11.1993. The Motor Vehicle in the custody of ‘B’ meets with an accident on 6.11.1993 and the name of the owner of the said vehicle is not yet changed in the R.C Book. ‘A’ has not sent an application in the ‘Prescribed Form’ about the Transfer of Motor Vehicles to the Insurance Company immediately. Whether the mere transfer of motor vehicle entangles the statutory protection of just compensation amount to the victims. The driving of an uninsured Motor Vehicles is an offense, requiring punishment for 3 months Or fine of one thousand Rupees under Section 196 of the act. Moreover, in case of sale of a car or other vehicles, the person selling the motor vehicle shall apply within fourteen days, from the date of transfer, in the prescribed form to the insurer for making necessary changes in regard to the fact of transfer in the certificate of insurance and the policy described in the certificate in his favor and the insurer shall make the necessary changes in the certificate and the policy of insurance in regard to the transfer of insurance. The transfer of the motor vehicle puts an end to the compulsory insurance policy itself as the application in the ‘prescribed form’ is not sent to the Insurance Company. Further, the complication arises when the said vehicle is hypothecated by a Nationalized Bank and under such circumstances, the poor victims are shoved to the ‘sea of troubles’ for their inability of getting the compensation amount in time. Is A Pillion Rider Entitled to Road Accident Compensation in A Case of Two-Wheeler Accident Or A Co-Passenger in Case of Car Accident? The Supreme Court created a precedent to be followed in cases involving pillion riders and co-passengers. The liability of the insurance company in a case of this nature is not extended to a pillion rider or a co-passenger of the motor vehicle unless the requisite amount of premium is paid for covering his/her risk. The pillion rider in a two wheeler or a co-passenger in a car is not to be treated as a third party when the accident has taken place owing to the rash and negligent riding of the two-wheeler or car and not on the part of the driver of another vehicle. It is thus settled that, the liability of the insurance company is not extended to a pillion rider or a co-passenger of the motor vehicle unless the requisite amount of premium is paid for covering this risk. The legal obligation cannot be extended to an injury or death of the owner of the vehicle or the pillion rider. Further, the pillion rider on a two-wheeler cannot be treated as a third party when the accident has taken place owing to the rash and negligent riding of the scooter and not on the part of the driver of another vehicle. What if victims were also negligent while the driver was also negligent and the accident occurred due to the contributory negligence of both parties? For example, someone starts driving on a one-way road in the wrong direction while another car is driving in the right direction but, without headlights on. The two collide which results in severe injury to the two wheeler driver. Would he be entitled to any road accident compensation? Contributory negligence is when the claimant himself has been negligent and has contributed to the occurrence of the accident. In contributory negligence, the victim himself has contributed and therefore, his compensation gets reduced in proportion to his fault. Thus, if the victim is equally negligent and has contributed to the accident in equal measures, he would get only half the compensation. On the other hand, Composite negligence means where the accident occurs due to the negligence of two or more persons but, not the victim. In an accident involving two or more vehicles, where a third party claims damages for loss or injuries, it is said that the road accident compensation is payable in respect of the composite negligence of the drivers of those vehicles. In such a case, each wrongdoer is jointly and severally liable to the injured for the payment of the entire damages and the injured person has the choice of proceeding against all or any of them. What Happens in Case of the Accident Caused by an Underage Driver? Chachu giving keys to his niece and nephew is common in India. But, what would a person do if he is hit by a minor driving a vehicle? In these cases, Insurance company does not provide with road accident compensation on behalf of the insurer and the liability lies on the child’s legal parent or guardian. A child is not the bread earner of the family and hence, the death of a child during a motor vehicle accident involves different intricacies. Along with awarding for pecuniary losses, the court also has to award for future losses. Pain and suffering caused because of the sudden demise of life, the age of the child, while the accident took place, etc has to be factored in. The apex court formed a point that, while considering such claims, child’s performance in school, the reputation of the school etc. might be taken into consideration.When records show that the children were good in studies and were studying in a reasonably good school  then naturally, their future prospect would be presumed to be good and bright. Since they were children, there is no yardstick to measure the loss for future prospects of these children. However, as already noted, they were performing well in studies, the natural consequence was supposed to be a bright future. What Happens in the Case Where Victim of a Motor Vehicle Accident is a Housewife? When the victim of an accident is a housewife then the settled law is  “for the purpose of awarding compensation to the dependents” some pecuniary estimate has to be made of the services of housewife/mother. The amount payable to the dependants cannot be diminished on the ground that some other family member can take care of the well-being of the family as the deceased housewife did. In its wisdom, the legislature had, as early as in 1994, fixed the notional income of a non-earning person at Rs.15,000/- per annum and in the case of a spouse, 1/3rd income of the earning/surviving spouse for the purpose of computing the road accident compensation. The legal profession has its share of ‘ambulance chasers,’ as they are called in some of the western countries. These are the lawyers who make a living out of the motor vehicle accidents. It is a well-oiled network where the lawyers and the police act in close co-ordination. It is woeful to note that the moment an accident takes place, the Police Inspector concerned gets in touch with the particular network of lawyers. Such lawyers swoop on the hapless victims who are in a confused state and even when the dead body is placed for funeral ceremony or the said ceremony is just over, they allure the said victims with promises of getting the huge road accident compensation amount, without spending any amount of money from their purse even for the stamps in the M.A.C.T petitions. The poor overwhelmed accident victims believe the promises of such lawyers and entrust the briefs to them by signing the blank papers, including stamped papers and withdrawal slips, in advance without the knowledge of the victims in such cases. Further, their counsels themselves enter into the compromise with the Insurance company as to the compensation amount, even without the consent or knowledge of the victims. Section 163 A of M.V. Act deals with the situations involving hit and run cases.After the accident, either the victim or his legal representative can file an application to the Claim Officer of the taluka where the jurisdiction lies. After the proper inquiry and the procedure involving submission of post mortem certificate or injury certificate, road accident compensation may be provided from the solatium fund created by the government within 15 days. A lady passenger was getting down the bus and her one foot was on the footboard and other on the road, when the conductor gave the whistle and the driver moved the bus and she was knocked down and was dragged along by the body of the bus and sustained fatal injuries. It is the crew of the bus who is negligent for the accident which occurs at a place where the bus is to stop, though it is not a bus stop. “But the fundamental duty of both the driver as well as the conductor is to verify specifically, whether any passengers is getting into the bus or is getting down from the bus, before actually the bus is moved from the bus stop where it is stopped, irrespective of the fact whether that place or stopping is a bus stop or not”. The onus to compensate the victim lies on the owner of the bus or the insurance company of the bus owner. When a road accident compensation is awarded, the person who is required to pay that amount has to pay it within 30 days of announcing of orders. Even simple interest is applied on the amount from the date of making of claims. When the person required to pay the road accident compensation is willingly or otherwise not paying the amount, the tribunal can order Collector to recover the money as it happens in cases of arrears of land revenue. That’s all about “How can one claim for Road Accident Compensation as per M.A.C.T. Guidelines”. Comment Below your views. And, Don’t forget to share the article. Section 166,(3)(2) of Motor Vehicle Act,1988. Oriental Insurance Co. Ltd. vs. Sudhakaran K.V. (2008) 7 SCC 428. Andhra Pradesh Road Transport Corporation vs. K. Hemlatha,AIR 2008 SC 2851. S 168, Motor Vehicle Act, 1988. S 171, Motor Vehicle Act, 1988. S 174, Motor Vehicle Act, 1988. Posted on November 1, 2018 Author yazdiCategories Insurance, Traffic / Roads etc.